A recent report published by Transparency Market Research pegs the value of the global boron compounds market at US$1.98 bn in 2013. The market, according to the report, is likely to reach an estimated valuation of US$3.15 bn by the end of 2020. If the figures hold true, the market will exhibit a positive CAGR of 6.9% during the aforementioned forecast period. The report is titled “Boron Compounds Market - Global Industry Analysis, Size, Share, Growth, Trends and Forecast, 2014 - 2020” and is available on the company website for sale. The report presents a comprehensive overview of the global boron compounds market and provides insights into the factors that are likely to drive or restrain the growth of the market. Based on in-depth research, the report states that the total production volume of boron compounds stood at 1,759 kilo tons in 2013. Increasing demand from the ceramic tile industry for boric acid, which is an oxidized product derived from boron, will push the demand for boron compounds. Furthermore, rising application of boric acid in fiberglass is also anticipated to fuel demand from the global boron compounds market, states the report. While growth prospects for the market may seem rather positive, abundant availability of close substitutes is a major threat that might hinder its progress in the long run. The limited availability of boron ore, concentrated only in a few regions around the world, also makes it difficult for companies in the industry to ensure smooth operation. With an aim to present an executive-level snapshot of the market, the report studies in great detail every factor that is likely to have an impact on the growth trajectory of the global boron compounds market. The boron compounds market comprises borax, boric acid, and other compounds such as boron oxide, sodium metaborate, boron trifluoride, and sodium perborate. Of these, the demand for boric acid, as per the report, is anticipated to register the fastest growth. In this regard, a lead TMR analyst said, “Increasing application of boric acid in the production of fiberglass and borosilicate glass boosts its demand in the global market”. Other boron compounds including boron oxide, sodium metaborate, boron trifluoride, and sodium perborate collectively held 19.1% of the global boron compounds market in 2013. In terms of application, the global market for boron compounds is segmented into agriculture, borosilicate glass, soaps, ceramics, detergents, fiberglass, and others. In 2013, the market was led by the fiberglass segment, which accounted for 31% of the total market. 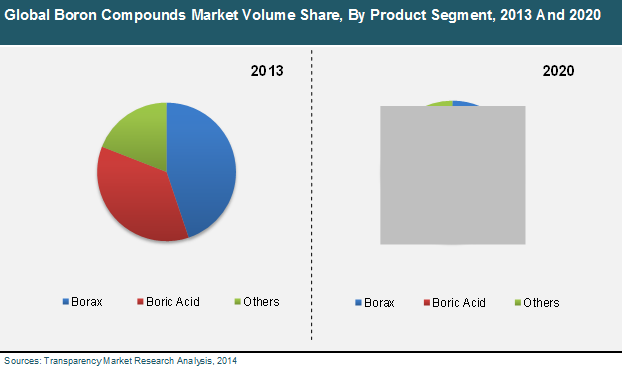 In terms of geography, the boron compounds market in Asia Pacific led the global boron compounds market in 2013. TMR analysts project the market to expand at a CAGR of 6% between 2014 and 2020. During the same period, the boron compounds markets in North America and Europe are likely to exhibit a moderate growth rate. The report profiles leading companies operating in the market to study its competitive landscape. The companies profiled in the report include Borax Morarji Ltd., AkzoNobel, Boron Compoundss Ltd., Eti Maden, ESK Ceramics, and BASF.